Pluto, imaged by the New Horizons probe. 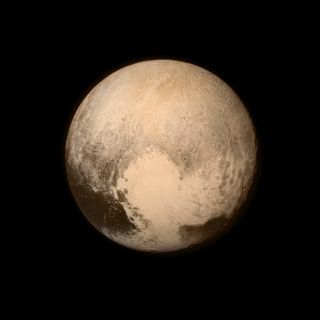 The heart-shaped region in the lower hemisphere was renamed recently by the mission team, from Sputnik Planum to Sputnik Planitia. The western lobe of Pluto's famous heart has a new name. Members of NASA's New Horizons mission team gave unofficial names to the dwarf planet's features when the spacecraft revealed them after its historic flyby last year. The western side of the smooth, heart-shaped region on the dwarf planet's surface has since been relabeled to make it more geologically accurate. The team didn't originally think the plain was elevated, said William McKinnon, New Horizons geology, geophysics and imaging team deputy lead and a planetary scientist at Washington University in St. Louis. But in the first few days after the flyby, as a whole new world of never-before-seen features came into view, the group started quickly spewing out suggestions for names. "Maybe we jumped the gun," McKinnon told Space.com with a rueful smile. Most likely, Sputnik Planitia formed when a large object slammed into the young dwarf planet, McKinnon said, though the depth of the plain remains unknown. Today, the basin appears to be filled with volatile ices (meaning they melt or sublimate at low temperatures). New Horizons spotted no impact craters across the plain, suggesting that the ice is less than 10 million years old, the team said previously. But Sputnik Planitia could end up with another new name, because the current monikers for all of these features are still unofficial. More than 15 months after the historic flyby, the team has yet to submit any names to the International Astronomical Union, which oversees the names of features in the solar system. New Horizons principal investigator Alan Stern, of the Southwest Research Institute in Colorado, said the small team has been extremely busy with the new data that has streamed down since the flyby. The last of the Pluto flyby files arrived on Earth on Oct. 23. "We're not going to be distracted," Stern told Space.com.